- Do you like Pick Up Lines? Over 100+ for free! - Do you like laughing? - Do you like funny stuff? 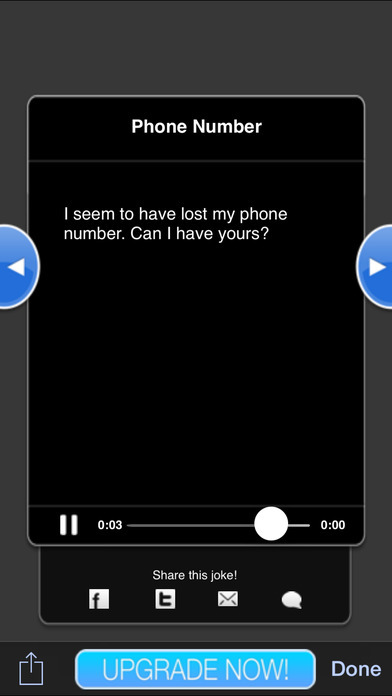 - Then this is the app for you! 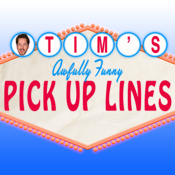 Awesome sound board that plays over 100 Hilarious pick-up lines all read by hilarious comedian Tim Brennan! Now even more fun! 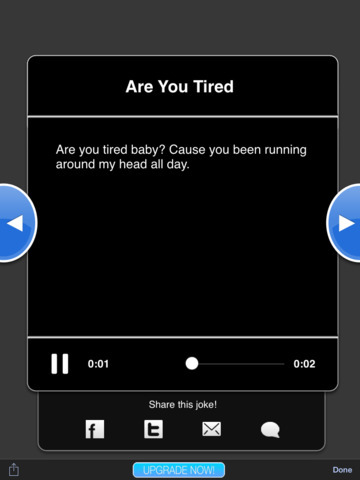 you can read the jokes as well as hear them! Play it for friends and family! Talk to real life women! You can plug in a bluetooth headset or headphones and play the lines into your eye and just repeat them to attractive women or men. You might not get their number, but your sure to get a smile, or maybe just a mean look! Fun for hours! and educational too if you're looking for some great lines to make the girls smile! And you can even share them with friends via, facebook, twitter, SMS, or E-mail! Or if your just looking for a way to entertain yourself than this app will do that too! !